Parents represent an increasing number of adult college students. Older students going back to college face advantages and disadvantages unique to their situation. The financial sacrifices involved and struggle to balance course loads with work and family commitments represent the biggest disadvantages. However, the challenge of finding adequate resources to fund a college education provides strong motivation to finish the effort. As a result, adult students are more likely to understand the value of an education and better positioned to focus on what they want to learn. Older students bring connections and life experiences that give them an edge in the job market. Adult learners are typically hoping to make a mid-career transition, or upgrade their skills, according to Jennifer WIlliamson of the "Distance Education" website. Unlike younger peers, an older student already knows what companies or industries might need his skills. He also has more relevant work experience that might lead to a potential interview or job offer. Pursuing a college education requires a disciplined attitude to make the effort pay off, as freelance writer and returning student Vickey Kalambakal observed in a commentary for the "Back to College" website. She asserted that adult learners have an advantage over younger students living away from home for the first time. Having gotten the traditional distractions of dating and partying out of their system, older students are better able to focus on what's happening in the classroom. As a returning student, you have an opportunity to become a positive role model for others. It's no coincidence that many older students are also parents. Making your education a priority underscores its importance for your children, while teaching them the persistence that's needed to achieve a major life goal. This type of observation doesn't happen in families of traditional students, whose education is normally happening away from home. Returning to school as an adult requires juggling class schedules with family life, work and other personal commitments. Mature students voice concerns about finding enough time for family members and how to deal with a partner who may not appreciate the idea, according to Deborah Neuheisel, an adult student adviser for the University of Wisconsin-Barron County. Failure to learn time management skills can undermine an adult student's confidence and make it difficult to continue her education. Funding an education can be daunting for older students, who are less likely than younger peers to get financial aid or scholarships. You must weigh all the financial risks carefully, since you can't discharge student loan debts through bankruptcy, as author Stephen A. Laser notes in "Fobes" magazine's June 2012 report. Factors to consider include the school's placement rate, industry outlook and if the degree will actually boost your lifetime earning power. What Are the Benefits of College Vs. Technical School? Heibutzki, Ralph. "Advantages & Disadvantages of Older Adults in College." 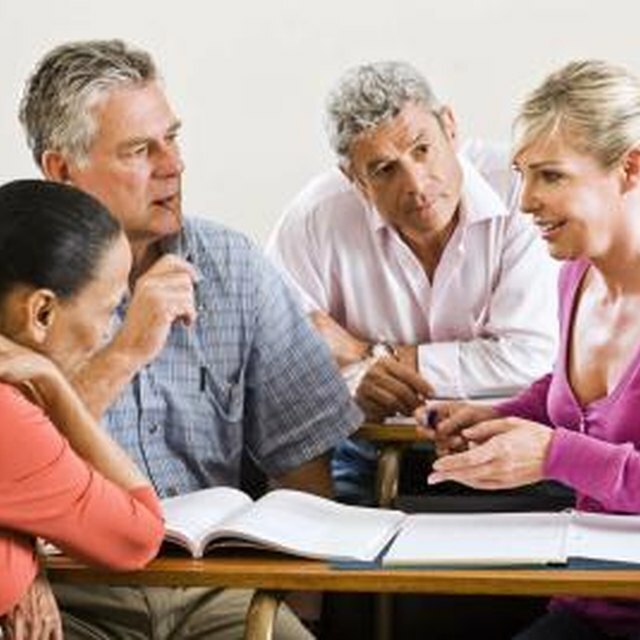 Synonym, https://classroom.synonym.com/advantages-disadvantages-older-adults-college-6562.html. 26 September 2017.